While "Lin-sanity" might be wearing off, NBA fans are looking to the NCAA Men's Division I Basketball Tournament to fill their hunger. The NCAA or the National Collegiate Athletic Association includes almost all American colleges and universities. This association hosts a single-elimination tournament in March where 64 teams compete for the championship title. This time of the year is known as March Madness or the Big Dance as many fans take part in "bracketing" or seeding predictions of who will win. Many prominent figures and celebrities take part in predicting the outcome as well. Even President Obama's bracket is posted on the White House website! Anyone can take part in this game! Just log onto http://games.espn.go.com/tournament-challenge-bracket/en/ to create a free account and enter or create your own group to start seeding. 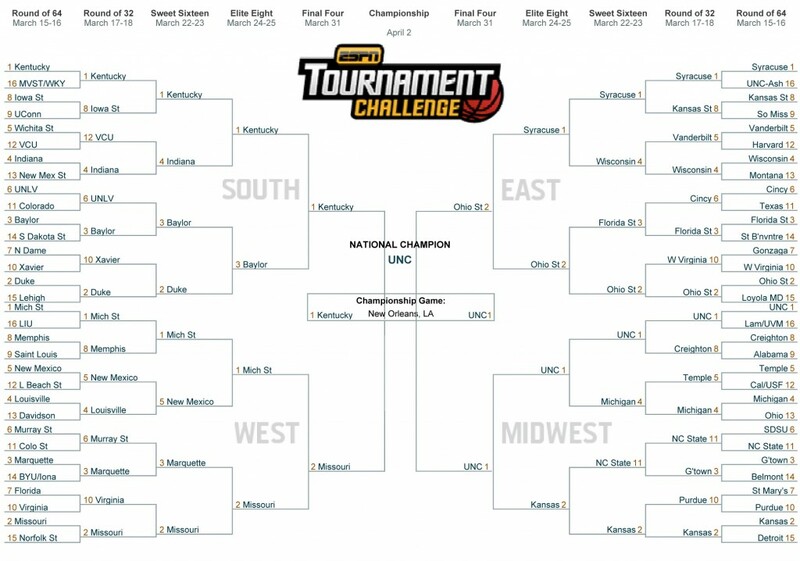 When creating your bracket, you first select the teams to win in a Round of 64 or R64. Then three-fourths of the teams will be cut each week. Round 64 will become Thorough 32 or R32, then on to the "Sweet Sixteen" or S16, "Elite Eight" or E8, the famous "Final Four" or FF, until finally you can select the NCG winner or National Championship Game, along with your final score predictions. Is Obama right about UNC winning the championship game? This remains to be seen. Watch the NCAA Men's Division I Championship Game to find out! NCAA game lasts just 40 minutes instead of 48. NCAA teams can call a timeout after they made a basket. In college basketball, it is required that the home team wear their light-colored jerseys while the visiting team wears their darker jersey color. NCAA players are not allowed to wear any jersey number with a 6, 7, 8, or 9. The foul-shot line and three-point line are slightly closer to the basket in the NCAA.